Honey bee diseases start to affect the health of your colonies long before warning signs become apparent to novice beekeepers. This article gives new beekeeping enthusiasts basic knowledge of the two most common diseases that affect honey bee hives in North America and beyond. Unlike pests that invade honey bee colonies like varroa mites and wax moth larvae, the bacteria that cause honey bee diseases are not visible to the naked eye. Therefore, the tell-tale symptoms of these diseases are typically noted first. While a definitive diagnosis usually requires lab testing, here are a few of the visible signs that most frequently point to infection with American or European foulbrood. American and European foulbrood constitute a serious threat to the health of honey bee hives across the world. While this article is a good introduction for those unfamiliar with these diseases, positive identification and successful treatment can become a complicated and prolonged process. If you suspect your colonies are infected with AFB or EFB, we recommend enlisting the help of a veterinarian who has experience in treating honey bee diseases. Before 20th century advancements in identification of disease-causing agents, both the American and European varieties of this disease were known collectively as “foulbrood.” Interestingly, the modern designations do not indicate the origins of the diseases, but rather where they were first scrutinized with modern diagnostic techniques. American foulbrood, often referred to as AFB, is caused by a bacterium that infects young after they ingest food contaminated with the spores of Paenibacillus larvae. These spores, also called endospores, are the dormant form of the bacteria. P. larvae spores are able to survive many years in conditions that kill off bacteria in the growing, or vegetative state. In fact, spores of AFB may survive 40 years or more on beekeeping equipment and in contaminated honey. This is one of the primary reasons behind the advice to never feed your colonies with honey from another hive! American foulbrood infections take hold in the youngest members of a honey bee colony. Larvae between one and three days old become infected when they are fed honey or pollen that contains the bacterial spores. As the infected larvae are sealed in their cells, the bacteria multiply in their gut and quickly kill them. These bacteria then form more spores, potentially up to 100 million or more, as the larvae die and turn dark from the infection. When the colony workers clean out the dead larvae from cells, they inadvertently spread the spores throughout the hive. Once the infection starts, the spores spread rapidly throughout the colony’s brood and food stores. As fewer and fewer young survive, the colony weakens and becomes susceptible to robber bees. The spore-containing honey is then carried to a new hive, starting the cycle anew. 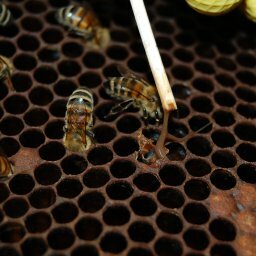 Beekeepers may also spread American foulbrood spores among their hives through using contaminated tools and equipment. The name “foulbrood” is a reference to the odor that often accompanies advanced cases of AFB. The dead and dying larvae put off a smell similar to rotting fish, an odor not easily forgotten once encountered. However, colonies in the early stages of infection may not exhibit this scent, so a lack of odor is not an ironclad assurance of a healthy colony. A good way to identify a suspected AFB issue is a close visual inspection of the brood. Brood comb in infected colonies often appears spotty and discolored, with sunken or punctured cappings. The dead larvae are most often found lengthwise on the lower surface of the cell with AFB. Dead brood range in color from a dull white to brown to black, depending on the stage of the infection. The remains of larvae are typically soft and described as “sticky” or “ropy” when prodded with a stick or toothpick. Dead larvae left in their cells for longer periods of time after succumbing to AFB dry out and form a dark, dry “scale” that adheres tightly to the cell wall. While reports of resistance are becoming more commonplace, treatment with approved antibiotics is often successful at combating AFB. Dadant & Son’s Tetra Bee Mix contains the antibiotic oxytetracycline; however, orders for this medicated product must include proof of a veterinary feed directive. There are several other classes of medication used to treat AFB, as well as instructions for treatment regimens using chemicals, medications and “home remedies.” No matter what course you decide to follow, it is important to isolate suspect colonies and equipment used in the hive to prevent the spread of disease. European foulbrood, or EFB, is also caused by bacterial infection. While M. plutonius is not known to form endospores, the bacteria may survive in individual bees and on equipment for up to several years. Hives with large, healthy populations and plenty of foraging opportunities are often able to overcome EFB infections, although the disease may resurface in subsequent seasons or years when food becomes scarce. Similar to AFB, larvae become infected with EFB when they eat contaminated food in the first few days of life. There is also evidence that the bacteria may be spread through bites from varroa mites in an infected colony. 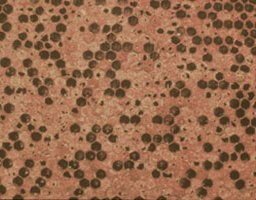 Unlike AFB, larvae that succumb to the EFB typically die from the infection before their cell is capped. Upon close inspection, larvae killed by EFB often appear twisted or curled in their uncapped cells and are described as “wet” or “mushy.” While some remains exhibit a small degree of the ropiness associated with AFB, this condition is not usually pronounced. When left in their cells, the larvae dry out to form a rubbery scale that is brown or black in coloration. Treating colonies with oxytetracycline, or OTC, is the recommended course for most EFB infections. In Europe, researchers are studying a technique known as the shook swarm method in conjunction with OTC to help combat the disease. As stated above, otherwise healthy and large colonies may overcome EFB on their own, although beekeepers should keep a close watch for reoccurrence. Read the first article in this series on honey bee diseases, Honey Bee Pests and Diseases, Pt. 1: Common Honey Bee Pests!